Just recently announced in an interview with Ten Ton Hammer, Turbine announced an upcoming update for the Lord of the Rings Online! Even though the most recent expansion back in September, The Rise of Isengard, was a huge success, I for one wasn't a huge fan. I've been a faithful player ever since the game ever since the game launched back in '07, but I feel as if the game only continues a slow trudge downhill. Ever since the first expansion for the hit MMO came out, Mines of Moria, the proceeding updates and expansions felt rushed unfinished, and overall, just didn't feel like The Lord of the Rings. The original game brought forth a world that I felt was unique unto itself and put out a vibe that just felt amazing. In my opinion, it really felt like the Lord of the Rings universe! My opinion on the game hit a new low after the last expansion thanks to the lack of content. The expansion brought only one new dungeon, a 24 man raid, three new zones, two of which were awfully small, and only one new book to add on to the story (The highlight of the game for me). I know many players who were complaining that they had run out of content to do in order to reach the new level cap. They were forced to go back and repeat content they've already done! The expansion as a whole just didn't feel like it was ever finished. Getting back on topic, Update 5: Armies of Isengard seems to have a ton of potential. The update will add an entire new book to the story, five new instances (dungeons), and the long awaited instance finder that many of us have been begging for! This all sounds too good to be true right? For me it's not. I feel as if all of these great additions should have been in the latest expansion, not an update. If they had just backed up the release date a month or two, they might've had the time to squeeze these components in there! The expansion would have been a lot bigger than it was and the expansion would have received much better appeal from both critics and fans alike. Darnakh Unleashed: Enlist as part of a covert mission to sabotage the inner workings of the Isengard war machine. Cause widespread destruction by turning a wild troll against its would-be masters and uncover clues about Saruman"s nefarious plan taking shape within the shadows of Orthanc! Fangorn's Edge: Players must scout out and disrupt one of Saurman"s lumber operations on the outskirts of Fangorn forest. Eliminate Uruk foresters and guards and contend with their violent overseer but beware for when Fangorn forest is involved not everything is as it seems! Pits of Isengard: Players can descend into a forgotten laboratory in the caverns beneath Orthanc where twisted experiments still roam. Face terrible abominations, discarded as Saruman endeavored to perfect the monstrous Uruks. Make haste as you delve deeper into the pits and discover the truth about Saruman"s plans! Along with that, a new six man instances is coming, The Foundry, in where powerful and mysterious weapons have been appearing in the hands of soldiers under Saurman"s command. Players must Infiltrate the Foundry, the sprawling subterranean heart of Saurman"s war effort, and disrupt the supply of the dangerous weapons to deal a fateful blow to Isengard! Perhaps the highlight of the new update is the new upcoming 12 man raid, The Tower of Orthanc. Players will finally get to face Saruman himself. The raid is split up into three different parts. The first stop in the raid, players must tackle three seperate wings, in any order, in an effort to capture the minor rings of the end bosses. Each wing should only take 30-45 minutes. The trash mobs preceding each boss aren't just an annoying waste of time either. They give clues to the patterns and makeup of the boss fight ahead! After all three wings have been cleared, it's time to confront the Shadow boss. This fight will be much more difficult than the previous bosses you just fought. The foe must be killed in no more than 10 minutes. Glowing blue walls will slowly close in on the players forcing you into a more compact battleground. Oh, and the boss had a whopping 1.5 million hit points! Scared? He also can throw up a self-healing bubble that needs to be taken care of asap, else your pretty much screwed… If your brave enough to take him on in challenge mode, you must defeat him in less than 5 minutes. Good luck! The final part of the raid is the fight with Saruman himself! If your getting all giddy over whether or not you can kill him, I guess I'm the bad guy who has to break the bad news to you. You can't. Read on to find out why! At the beginning of the fight, five members of the raid will have to pick up one of the minor elemental rings in order to reflect Saruman's power back against him. The other seven members will receive huge buffs that will quote on quote from the devs, " have you make bigger numbers than you've ever seen in this game." A raid can fail in not just one, but two ways now. The obvious answer, a wipe, or if you fail to reflect Saruman's damage three times, or if 10 members of the raid die, the fight will automatically end. Another way you could die is if you fall of the side of the tower. Yep, there are no guard railings! The fight goes on into various other stages where Saruman has the power to control weather, create dangerous hot spots, and even summon clones of himself that will only add to the chaos! To only make matters worse, Saruman is the first mob in the game to deal light damage. Therefore, if you're prepared for the drastic change, you will get pounded! If you manage to reach the end of the fight, you eventually destroy his protective ring and can now hurt him. He has other plans than death though, and it's at this very moment where you are all blasted off the roof, but are thankfully saved by giant, flying eagles! Accompanying the slew of new dungeons is a new tool called the instance finder. It is a pretty straight forward tool to use. You just simply select the roll your character will play, Defense (Tank), Healer, Support, or Damage. As of now, the tool is restricted to only finding a group from those of whom are on your server. Once you click join, you're put into a queue with a timer. 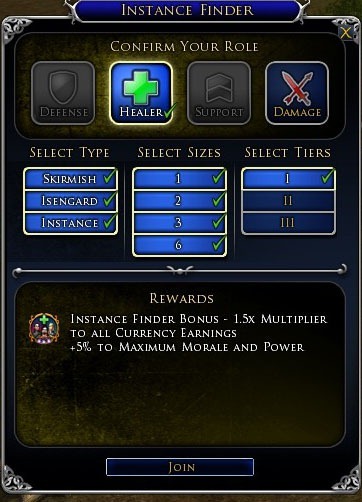 If a a fellowship is not found by then, you are offered a solo skirmish with a rewards bonus for using the instance finder tool. If the opposite occurs, members will begin to fill up in a list on the tool with their name and selected role. Once a full party has been found, everyone must confirm they're ready until you can enter the dungeon. This part I despise. You cannot choose the instance you would like to join. You're plopped in one at random depending on which type of instance you all chose at the beginning, skirmish, scaling, or Isengard. What is up with that? If I can't even select the dungeon I would like to run, the demand for me using it just went way down. Hopefully we'll see an update in the future addressing this. Finally, the icing on the cake, update 5 will be bringing us a new installment to the epic storyline. The disappointing part is that is only spans four chapters! It still is my favorite part of the new update though as we get to continue you the excellent tale of the Grey Rangers trek south. The new book, title The Prince of Rohan, seed us, the players, parting from the Grey Rangers as they continue south to Rohan to meet up with Aragorn, while you stay behind to assist Theodred and the contingent of Rohirrim in Dunland. At the beginning you say your goodbyes to the rangers and receive an amazing new gift! You get the choice between the "classic" Ranger garb from the Shadows of Angmar era and the new Grey Company design to wear as a cosmetic item. You can now dress as the ranger! The rest of the book sees you helping Theodred defending the borders of Rohan from Isengard. He's decided that the best defense is a good offense, so he takes the fight to the gates of Orthanc. This results in an awesome, multi-stage battle that becomes the centerpiece of the book. Without spoiling the outcome, it is a great example of Turbine's drive to create epic, large scale battles for the forthcoming content! No official release date has been given for the new update, but Turbine has confirmed that it will be released sometime in December. While it has been big, new additions that all look exciting, I just wish they had been included in the expansion itself, rather than to be added on a few months later. It still looks exciting all the more and I know for sure 'll be there first hand to experience it all when it launches later next month!